Blogging is one of the most flexible and fun ways to make money from home. But when it comes to standing out from the crowd, you can’t just simply post an article and expect to generate the big bucks. According to Statista, there are currently over 30 million bloggers in the world. The actual number of blogs is more when you consider that many bloggers have more than one blog. Even if you have a niched blog, chances are you’re competing with other blogs. In fact, when it comes to being noticed online, you’re competing with lots of noise from all over the place. Gone are the days where you can post a keyword-rich article and rely on SEO alone to get traffic. Today, you not only need great content, but also you need to add additional value, visual appeal, social media share including specific tags, and more. 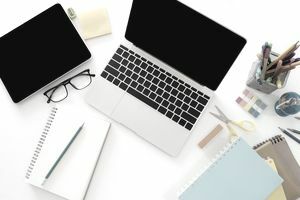 To help make sure you cover all the blog post tasks necessary to get your blog noticed, here is a checklist you can work through on each post. Below is the list with an explanation of each task, and below that is the basic checklist. Topic readers want to know about: While your blog post can cover a variety of topics, they all should be related and your articles should provide information or entertainment your readers want. Once you get a reader to your blog, you want them to stay to read it, sign up for your newsletter, and follow you on social media. To do that you need to give them great content that they’re looking for. Quality writing: Check that your blog post is free from grammar and spelling errors. Read it out loud to make sure it’s clear and flows well. Keywords: While longtail keywords may not have as many searches, they’re often better at generating search traffic than generic open keywords. Consider using a keyword tool, such as Google’s Adwords Keyword Tool or SEO Book’s Keyword Tool to help you identify the best keywords. You should have one main keyword you’re targeting, along with variations. Keyword and Keyword variation within Article: You don’t want to overdo it with keywords, but you do want to have them in the text and headers (<h1>) of your article. Internal Link: Have a least one link in the article that directs readers to another post on your blog. This link should be relevant or provide additional information related to the article. For example, in this article, there is information about SEO, but also, there is a link to an article that goes into more detail about SEO to further your understanding of it. External Link: While it might seem foolhardy to direct people away from your website, one factor Google uses to rank sites is the company it keeps, which includes outside sites you link to. This link can be a tool or resource. Consider coding your link to open in a new window tab (target=”_blank”) so they don’t actually leave your site. Social Share Graphics for the Social Media Platforms You Use to Promote Your Blog: This is where blogging can become time consuming because there is no one-size-fits-all when it comes to social share graphics. You only need to make them for the platforms you share your blog posts on, the most common being Facebook, Twitter, and Pinterest. The pro version of Canva offers an easy tool to resize a single graphic into the various other sizes, so you can make a Facebook graphic and with a click, resize for Twitter, Pinterest, Instagram and others. Social Share Messages: Along with a graphic, you can set up what gets shared when readers click on the share option. Plugins such as Social Warfare can help with this. You’ll want to make sure your Open Graph tags are set so Facebook can post the right information and graphic. If you use Twitter, you’ll want to create a Twitter Card. Finally, add a “Click to Tweet” to make it easy for readers to Tweet your message with a single click. Add to Category: This helps organize your topics so it’s easy for readers to find the content they want on your site. Tags: Tags add an additional level of organization to help your readers find what they need. Monetize the Post: An easy way to monetize is to have an affiliate link in the post. If the post isn’t conducive to an affiliate program, use your internal link to a page on your site that has an affiliate referral. Other monetization options are ad feeds, such as AdSense, or selling your own information product. Lead Magnet or Content Upgrade: You should never miss a chance to get a new subscriber to your email list. The easy way to do to this is to include information about your lead magnet and your subscription form within the blog post. Recently, many bloggers have taken this idea a step further and are offering content upgrades. A content upgrade is an additional something of value that enhances the blog post that readers can get by giving you their email address. This can be a resource list, checklist, short report, video tutorial, or whatever would add more value to the post. Not all blog posts need a content upgrade, but since they offer more specific value, it doesn’t hurt to provide them on the posts that are conducive to an additional perk. You can use a single content upgrade on multiple posts as well, as long as it enhances the information in the article. Call-to-Action: Technically, blogs are social media because they’re set up to be interactive. You can encourage your readers to engage with you by using a call-to-action. Some things you can ask them to do include leave a comment, take a poll, check out your product or service, or request your lead magnet/content upgrade. FTC Disclosure Statement: The law requires you disclose any possibility of compensation for the information on your blog. If you’ve been paid for the post, have an affiliate link, received something free, or any other benefit you can get from the post, you need to let your readers know that. Most bloggers have a brief disclosure set to automatically appear at the top and/or bottom of their posts. Be sure to include a link to your full disclosure. Link to Privacy: If your blog is read by people from the European Union, make sure you have a link to your privacy statement that outlines how their information may be used per the GDPR. Most bloggers have this set to appear on every page of their site. Promote the Post: Once your post is ready, hit publish and then let the world know about it. There are plugins that will automatically share your post on social media. You can also share with your email subscribers. If you syndicate your posts, let those outlets know about it.